From Scientific American: Daniel Tammet can recite 22,514 digits of pi. He holds the European record for such a feat. So, I guess there is a competition? The article covers an interview with Mr. Tammet in which he discusses memory and I.Q. tests. As I peruse the internet I am fascinated with the many different ways people spend their time. 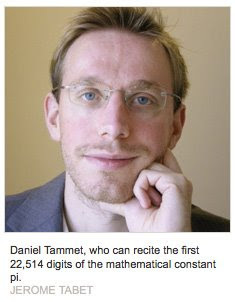 How long did it take Daniel Tammet to memorize that many digits of pi? 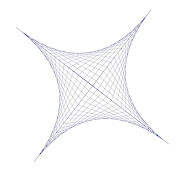 Typing pi to 22,514 digits in a continuous (no spaces) stream, in a Word document with smaller than average margins, using Times New Roman, size 12 font, single-spaced, would take 5 or 6 pages of paper. An interesting relation: Suppose Mr. Tammet can recite 2 digits per second (a reasonable estimate). Then it would take approximately 3.13 hours to recite 22,514 digits. In other words, it would take close to pi number of hours to recite pi to 22,514 digits.